Happy Halloween! We are proud to share that The Bill Tracy Project is three years old today, and with that, we would like to convey some exciting news to celebrate our anniversary. 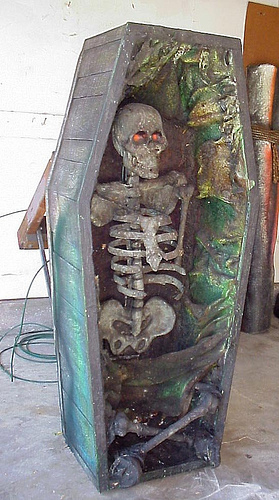 A few weeks back, a collector contacted The Bill Tracy Project from Oklahoma and informed us he had in his possession several stunts and miscellaneous props from the defunct Bill Tracy ride Phantasmagoria which previously resided at Bell's Amusement Park in Tulsa, Oklahoma. He had taken ownership of the stunts at an auction a few years back when the ride closed and he was looking for a collector to buy them. With preservation being the first and foremost goal of this project, it seemed only necessary that these stunts end up in a new home, and preferably, another Tracy ride. As such, we immediately sprang into action. For the past several weeks, Brandon, also founder of Trimper's Haunted House Online, has been managing the project, working diligently to coordinate the transaction between the seller and buyer, and has developed a plan for installation of the Phantasmagoria stunts at Trimper's Haunted House in Ocean City, Maryland. Brandon will be on-site during the installation and will be assisting with restoring and cleaning the stunts before being incorporated into the ride within the next few weeks. The incorporation of these stunts will make Trimper?s Haunted House not only the longest Tracy ride left on the Earth, but the only ride that contains stunts from three Tracy rides in one; Ghost Ship, Phantasmagoria, and of course, the original Haunted House. We are thrilled about this next chapter of The Bill Tracy Project featuring "hands on" preservation, and we can't wait to share the outcomes of this endeavor. Stay tuned to The Bill Tracy Project and Trimper's Haunted House Online for updates regarding this exciting project, and be sure to check out Trimper's Haunted House next summer for the debut of the new stunts! One of the original Tracy stunts from Phantasmagoria that will be installed in Trimper's Haunted House can be seen below. We are once again happy to announce that one of our biggest curiosities has been solved! 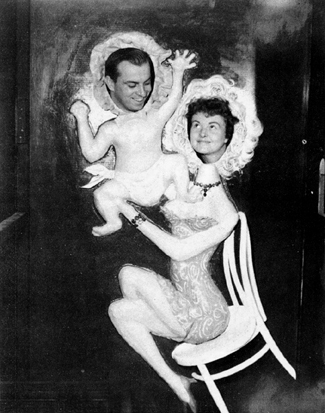 The man and woman pictured in the Peek-A-Boo stunt in the "We WORK in the DARK" catalog are Robert Davidoski, a gifted builder and painter who worked for Tracy in the early to mid 1960s, and Tracy's secretary, Cornelia Couch. Bill Tracy was very close with Cornelia as she handled his finances and often gave him opinions and consultation regarding different aspects of the business. According to the recollections of several individuals who worked closely with Bill Tracy back in the 1960s, Tracy was a very eccentric dresser. Based on memories from Manfred Bass, an artist who worked as a sculptor for Tracy and was instrumental in the development and installation of Jungle Land on Hunt's Pier in Wildwood, NJ, Tracy would often wear flowered Hawaiian shirts and tan slacks as part of his casual working attire, and pinstripe dark blue suits when meeting with clients. His normal footwear was generally a worn out pair of loafers. Cool, huh? Randy Skalos of Waldameer Park in Erie, Pennsylvania, had the opportunity to completely restore several stunts in the Whacky Shack this past spring. Needless to say, he did an amazing job of bringing some of Tracy?s classics back to life, along with a few other non-Tracy stunts. Check out a few photo galleries of his work. Salvaging the Wreck: Ocean Playland's Ghost Ship is Brought to the Surface. Enjoy! 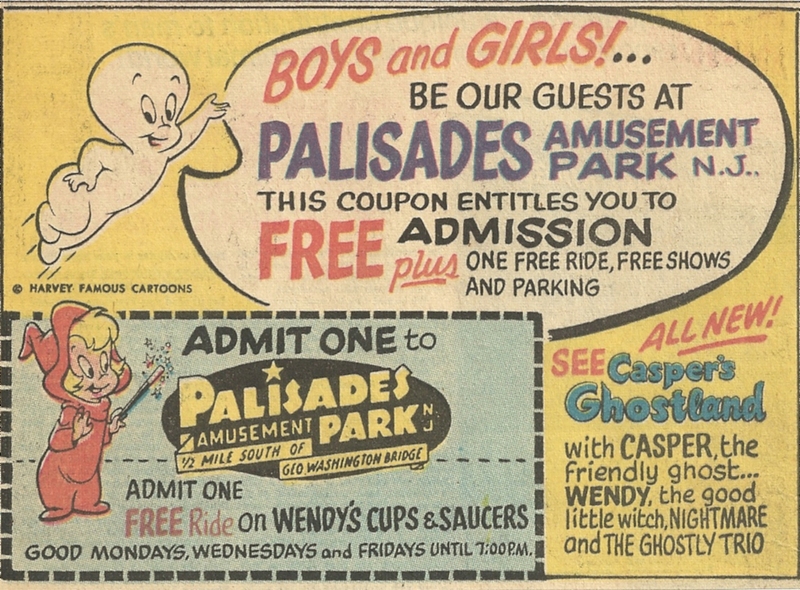 This vintage Palisades Park ad appeared in a 1968 comic book. Casper's Ghostland is featured in this ad which opened the same year. 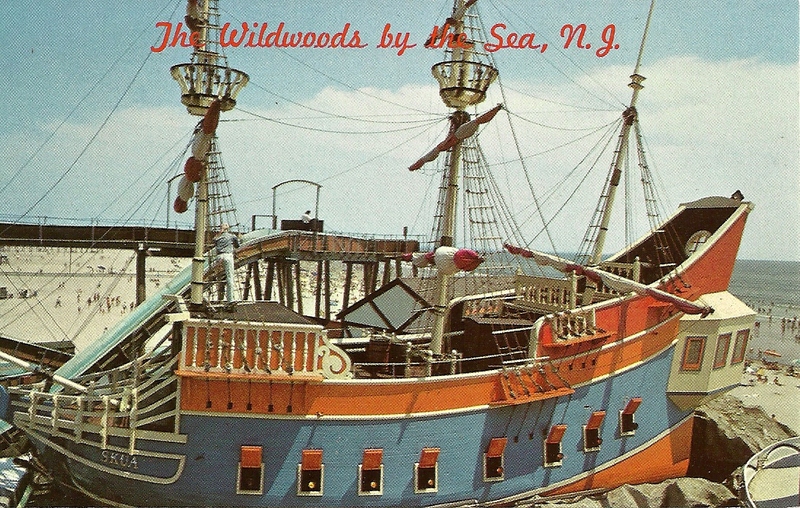 Palisades Park, located in New Jersey, unfortunately closed only three years later in 1971 and the ride was eventually demolished. We are pleased to finally release a photo of Whacky Shack at Joyland Amusement Park in Wichita, KS as it looked before the dip was removed! This Whacky Shack opened in 1974 and is known as Tracy's final project before he passed away in August of the same year. Note: The random and colorful "stained glass" pattern and large opening above the dip is very similar to what was constructed five years later for the Tracy inspired Lumalusion. This rare postcard offers an incredible view of Pirate Ship Skua. The owners of Hunt's Pier had an excellent relationship with Tracy, as they commissioned him to install four attractions at their park from 1959 to 1964. Unfortunately, all of these attractions have been demolished. Enjoy a postcard that features both Jungle Land and Golden Nugget at Hunt's Pier in Wildwood, NJ all in one photo. Tracy's attractions sure did get their fair share of attention! This postcard is actually for the Sky View attraction at Hershey Park located in Hershey, PA, but offers a nice color shot of Tracy's now defunct Lost River. 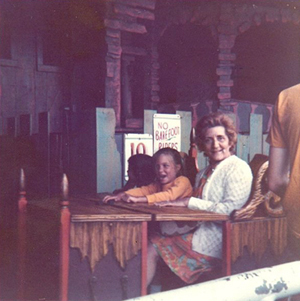 This is the only color photo that we have ever seen of this ride! Happy summer folks! The final day for the Tracy Contest will be June 30, so if you haven't already submitted a photo of the mystery ride at Chapultepec Park, you still have time. Don't forget, you have a chance of winning a Bill Tracy Project t-shirt! In the mean time, check out this newly-discovered photo of Jack and the Bean Stalk at Fantasy Island in Grand Island, NY. 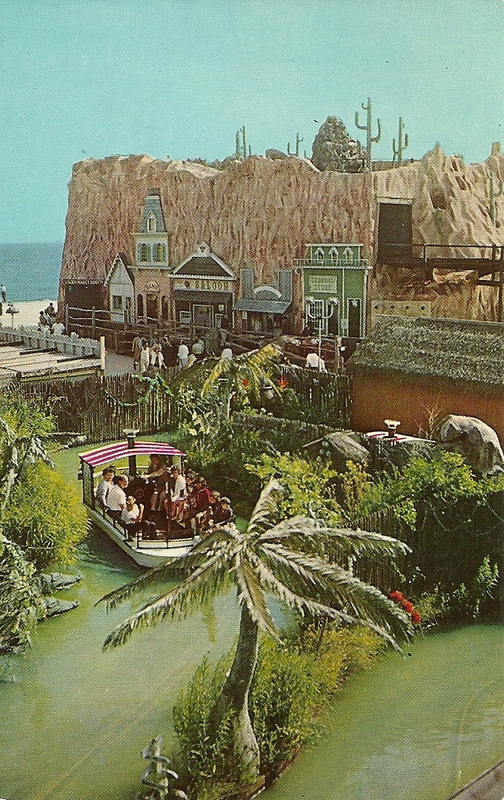 This photo appeared as part of a Fantasy Island souvenir postcard folder and is dated 1963. The dark ride that Tracy installed at Chapultepec Park in Mexico City, D.F. is very high on our list of those attractions that we are trying to acquire a photo or any additional information. Currently, the only information that we have is as follows: the attraction opened in 1964, it supposedly closed in 1994, it was a two-story package dark ride, Allan Herschell Company Inc. supplied the ride system which contained 10 ride cars, the uphill section of track used a chain and drive assembly that assisted the cars to the second floor and the downhill section of track also used a similar chain and drive assembly that assisted the cars back down to the first floor, and in an Allan Herschell service bulletin and packing list, they referred to the ride as TRACY DARK RIDE #3 - MEXICO. At this point we are assuming that the ride cars are the same ones used at West View Park's Haunted House and Whacky Shack at Hunt's Pier, the dark ride in Mexico being the third that used these cars. 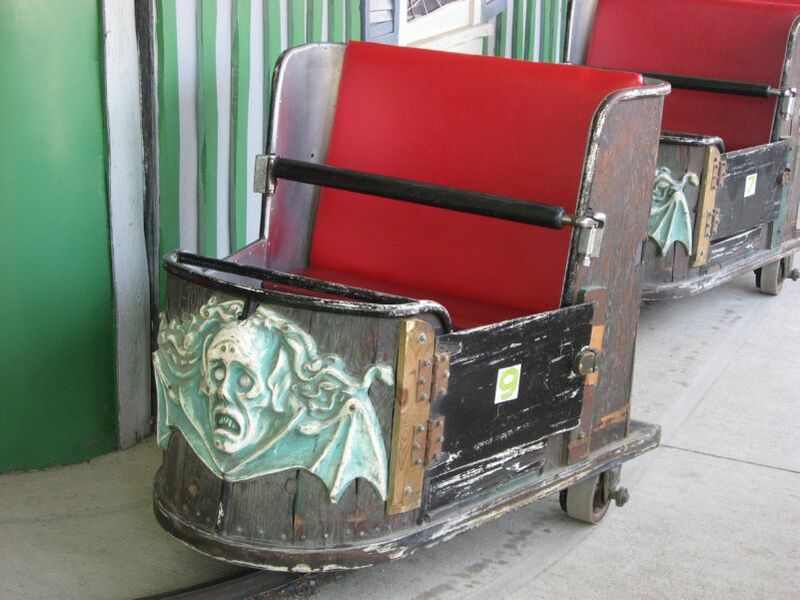 Could this ride have been a sister attraction to the Haunted House at West View Park in Pittsburgh, PA? Any additional info would be greatly appreciated, as we are currently at a dead end. As a reward, the first person to submit a photo of this mystery ride or any other Tracy attraction we don't yet have a photo for will win a Bill Tracy Project t-shirt. Good luck! After additional research by The Bill Tracy Project, it is now known that the Lumalusion at Fair Park in Dallas, Texas was not built by Bill Tracy. Lumalusion has been removed from the list of surviving attractions and moved to the influences section of our website. We apologize for any confusion or misdirection this may have caused. The story of Lumalusion is actually quite an interesting one. Charles Noland of Amusements, Inc., located in Dallas, took some time in December of 1978 to travel to a few relatively nearby amusement parks to find some inspiration. During his trip he visited Whacky Shack at Joyland Amusement Park in Wichita, Kansas, Phantasmagoria at Bell's Amusement Park in Tulsa, Oklahoma, and Fantastic Journey at Wonderland Park in Amarillo, Texas. At each park he took photos and documented these dark rides so that he could replicate some of his favorite features including Bill Tracy's famous Whacky Shack facade. 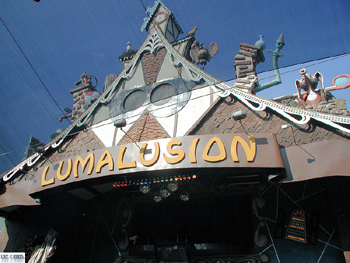 Construction started on Lumalusion, a name meaning light illusion, in January of 1979. Everything was built in-house except for the 16 dark ride fiberglass car bodies, which he made from a Hush-Puppy car body mold that he acquired. Even the building itself was designed and built in-house. The building's footprint was smaller than a typical Tracy 2-story dark ride. Tracy's buildings were approximately 70' x 80', where Lumalusion was 55' x 60' and included restrooms and shower facilities for the park employees. The smaller building created the need for the ramps to be steeper than in Tracy's 2-story dark rides. This created an interesting challenge as the typical Hush-Puppy car's motors were not strong enough to negotiate these steeper inclines. A custom built chassis had to be constructed with a more powerful motor for the drive system of the ride car. Specially built safeties were also installed that shut all of the cars down if any two of them got too close together. The interior was filled with optical and light based illusions. The facade was built completely on a level section of ground. Once finished, a crane lifted it into place on the completed building. After working almost 100 hours per week from January through June of 1979, Lumalusion officially opened on July 4, 1979. The ride has been a favorite at the State Fair of Texas and has remained almost completely unchanged since it opened more than 30 years ago. Lumalusion is a familiar "face", but is also a unique, durable, and well-built ride in its own right that deserves its own place in dark ride history. This ride is a lasting tribute to the influence that Bill Tracy had on the dark ride industry and is expected to entertain guests at Fair Park for years to come. A special thanks goes to Charles Noland of Amusements, Inc. for taking the time to share this incredible information with us! Sad discovery. 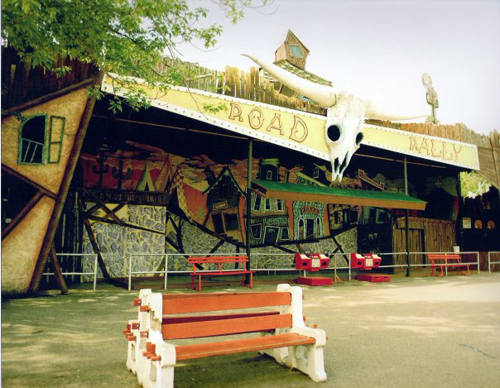 In the final year of Roseland Park in Canandaigua, New York, Tracy's Gold Nugget dark ride was converted to Road Rally, a remote control car attraction. As you can see in the photo below, the "dip" was removed to make way for the racetrack, a roof was added to protect the car controllers, and the sign was changed. The interior of the former Gold Nugget was used for storage. Tracy would have been very sad indeed! Exciting discovery! It turns out that Bill Tracy?s Kooky Kastle dark ride at Paragon Park in Nantasket Beach, Massachusetts also had Hush-Puppy Coffin Cars in use, just as Trimper's Haunted House! At this time, these are the only two known sets of Hush-Puppy Coffin Cars. 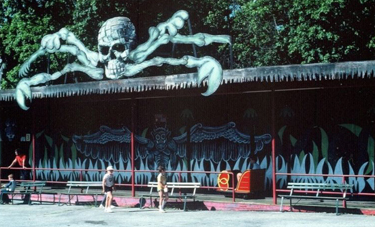 Check out this photo from the 1970s of Kooky Kastle's classic dark ride car! Pretzel Amusement Ride Co. placed this advertisement in the March 21, 1964 issue of Amusement Business and featured the Orient Express at Million Dollar Pier in Atlantic City, NJ. Tracy was responsible for the unique facade of this double-decker dark ride and Pretzel executed the gravity-powered ride system. Tracy's facades were often featured in Pretzel advertisements. Enjoy this ad that Bill Tracy placed in the March 21, 1964 issue of Amusement Business. This ad is very direct and is the only ad we have seen that focuses only on the financial benefits of having a dark ride re-themed by O.D.D. This article appeared in the April 21, 1962 issue of Amusement Business and describes the work Bill Tracy was performing on the Jungle Land water ride at Riverside Park in Agawam, MA. Note the construction photo at the bottom of the article showing where Tracy's stunts will be placed. This and many other articles can be found in our new periodicals section. This Jungle Land attraction was located at Panama City Beach in Panama City, FL. 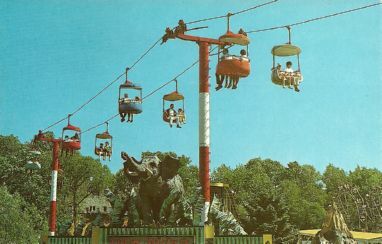 This attraction opened in the mid 1960's and is no longer in operation. 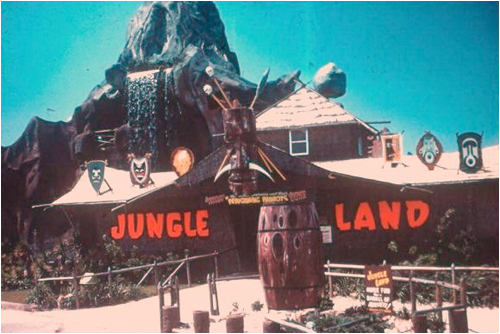 As far as we can tell, the displays for this Jungle Land were created by Bill Tracy. If anyone has any further information about this attraction please let us know! This article about the new Jungleland ride at Paragon Park appeared in the August 11, 1962 issue of Amusement Business. Tracy re-themed this ride again a few years later using his standard Lost River facade but called it Congo Cruise. The photo used in this article shows the original Jungleland facade. Check out a vintage photo of a Pretzel Amusement Ride Co. traditional dark ride at Lakeview Amusement Park in Royersford, PA. Note the classic Tracy skull that was used on the facade. Most likely Pretzel obtained this skull from Bill Tracy and used it to create a facade similar to those that Tracy built for his Ghost Ship attractions.